In the continuing saga that is G.I. Joe, we find Snake Eyes going back to his cabin deep in the woods, and Cobra comes to destry his serenity in the form of Firefly, Destro and Crimson Guardsman Fred Broca. It's a good thing that Hawk decided to sen Airborne and Spirit to keep an eye on Snake. And we see the return of the Soft Master, but why? 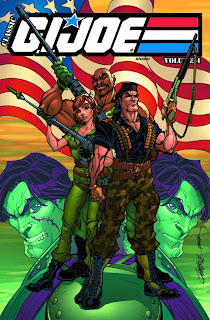 Another storyline in this trade finds the Baroness and Major Bludd training Billy to assassinate Cobra Commander during a huge rally in Springfield. What's their motivation and why use Billy? We find out the reason for using Billy later in the trade. What happens when Dreadnoks get bored? We find the answer in here as Buzzer decides to take Zartan's motorcycle for a little spin. They also cause quite a bit of mayhem. I think the mass quantities of grape soda and chocolate doughnuts facilitate their ADHD. We are also treated to the first appearance of brothers Tomax and Xamot. To be a little nitpicky, the cover shows one of the twins with the scar on his right cheek, but the scar is supposed to be on the left. I guess J. Scott Campbell (the cover artist) wasn't a G.I. Joe fan. These twins are a great addition to the Cobra organization. I remember in the cartoon series that they were the head of Extensive Enterprises, one of the legitimate faces of Cobra. Here, they are in charge of the Crimson Guard. At the end of this trade, we find the Joe team in a precarious position that leads into events that span into volume 5. Did the Real American Heroes get duped by Cobra? Guess you'll have to read this trade and volume 5 to find out. Add this to your collection if you don't already have it.